Be the first to share your favorite memory, photo or story of Saudia . This memorial page is dedicated for family, friends and future generations to celebrate the life of their loved one. Saudia Mateen was born on August 14, 1945 in Elizabeth, New Jersey as Victoria Jean Spencer. This particular day was also known as V-J-DAY, (the victory day over Japan), and for that reason her parents chose to name her Victoria. While growing up in Elizabeth, she began to have a love for the arts and particularly took interests in drawing and poetry. She graduated from Battin High School in 1962. After the completion of high school, she relocated to Boston, Massachusetts where she was employed for several years as a Secretary for WBZ broadcast television station. In 1973, she decided to change her name to Saudia Mateen and enjoyed life to the fullest. After residing in Boston for over 30 years, she unfortunately began to experience health problems. After a visit from her brothers, a decision was made to relocate her back to New Jersey. Saudia resided in Old Bridge for several years under the care of her loving brother and caregiver, Jeffrey Spencer Givens. 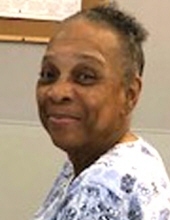 However, after several health challenges, Saudia entered the Autumn Lake Nursing facility in Berkeley Heights, where she resided for a short time prior to her untimely passing. Saudia was known as a sweet gentle soul, a lovable person who had a smile as bright as the sun. She loved to laugh, watch movies, dance, and enjoyed spending time with family. Saudia loved to eat and looked forward to an occasional order of Chinese food. A good meal always put a smile on her face. Saudia never married and didn’t have any children. On Sunday, September 23, 2018, Saudia Mateen departed this earthly life at Overlook Hospital in Summit. She leaves to cherish precious memories, her two maternal siblings: brother, Darrell Spencer and wife, Armineh Spencer of Woodland Hills, CA and Jeffrey Spencer Givens and wife, Patricia Givens, of Rahway, NJ; one aunt, Adabell Moore of Berkeley Heights, NJ; four nephews: Taylor Spencer and Kennedy Spencer of Oahu, Hawaii, Brandon T. Givens of Rahway, NJ and Joshua Spencer of Woodland Hills, CA; nephew-in-law, Antonio Cartagena of Maplewood, NJ; three nieces: Alexis Cartagena of Maplewood, NJ, Lena Spencer of Woodland Hills, CA and Shannon Bresnihan of Bloomfield, NJ; paternal step-brother, Robert Givens of Linden, NJ; paternal step-sister, Elizabeth Givens of Roselle, NJ; and a host of other family members and friends. To send flowers or a remembrance gift to the family of Saudia Mateen, please visit our Tribute Store. "Email Address" would like to share the life celebration of Saudia Mateen. Click on the "link" to go to share a favorite memory or leave a condolence message for the family.